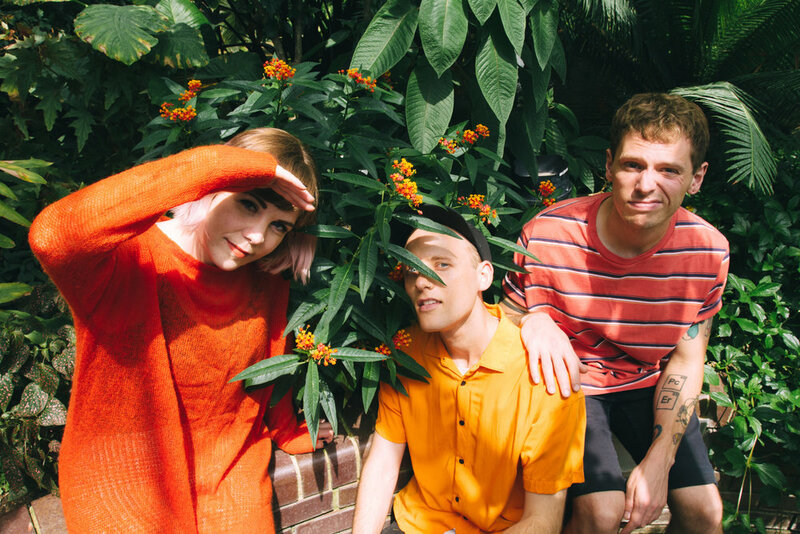 This weeks Band of the Week is London trio Doe, who have released their second album ‘Grow Into It’ today via Big Scary Monsters and Topshelf Records. We had a chat with the band about the album and how their sound has progressed from their debut release. ‘Grow into It’ seems a bit more musically complicated than ‘Some Things Last Longer Than You’. Did you find that you were pushing yourself to try new things? Jake: It’s funny you say that because we had another interview question last week that was like “There aren’t as many weird time signatures on this record, how come?” I guess people read what’s complicated and what’s not in different ways. I think this one builds on the guitar and vocal interplay in ways we haven’t tried before and introduces some instruments we haven’t previously used and it was exciting to us to try new stuff like that. I’m not sure if it was necessarily ‘pushing ourselves’ but more natural progression. Dean: Yeah I think a lot of it is natural progression, but I do see us actively pushing ourselves when we need to; we don’t wanna make the same thing over and over. When progression doesn’t come naturally, you’ve gotta search for stuff that sits on the outskirts of what u did previously. There’s a fine line between pushing boundaries and forcing something for the sake of it though. Lyrically, are you speaking from your own experiences or is it your observations of the world and speaking to friends? Nicola: I write about my own experiences but observations tie into that. Basically everything pisses me off so there’s plenty to work with. It would feel odd writing about other people’s experiences, but that being said sometimes if Jake has brought a song to the table he’s already got a specific chorus line in mind, so I’ll work with that as a basis and kind of steal it and run with it (sorry Jake). People always say that there is more pressure with the second album, as you have to live up to that of the first. Is this something you felt? Nicola: No. Our tastes are always changing so it’s just exciting to write something that you’ll prefer rather than worrying about what other people will think. The last one didn’t win any Brit awards so things can only go up. Jake: The only real pressure I feel is whether my parents are going to like it or not. I don’t think they were crazy about Some Things... but they seem pretty stoked on this one so I guess we did something right. ‘Heated’ was the first single to be released, from ‘Grow into It’. How do you go about choosing which songs should be singles? Nicola: ‘Heated’ is a bit weird and shows a shift in our songwriting since the last album, so we thought it would be more interesting to lead with that than one of the more immediate tracks. Rest assured they are all bangers, I’ve heard BSM are furious we haven’t released one particular song off the album as a single yet. You’ve just signed with Big Scary Monsters and Topshelf Records. Tell us how that all came about? Jake: We spent a long time considering options and thinking about where would make the best home for Grow into It. We went with BSM and Topshelf for a multitude of reasons too boring to add any value to an interview question, but what I can say is that we’re dead happy with our choice and that they both wanted to be involved. In October, you’re going on a UK tour with Speedy Ortiz. How excited are you to tour the new songs and get a reaction from the crowds? Jake: Very. We haven’t been playing live much recently but there’s still been all the day-to-day organisational stuff to deal with. We’ve been submerged in the boring admin side of being in a band without the fun of playing shows, so now we’re more eager than ever tour the new stuff. The fact we get to be out with one of our collective favourite bands on that particular tour is obviously a massive bonus! Nicola: It’ll be really interesting to play it to people who mostly are there for Speedy and see what the reaction is! I’m excited to play some new venues we haven’t played before too.